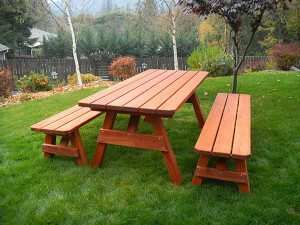 Each piece of Gold Hill Redwood outdoor furniture is handcrafted in our wood shop in the foothills of Southern Oregon. Every piece is fully assembled, and holes are pre-drilled for the screws and bolts. The item is then disassembled and marked with numbers showing where matching parts align. This allows for easy assembly by the customer. No additional drilling is required. When your receive your outdoor furniture, assembly should be very simple. Most of our redwood furniture is assembled by bolting or screwing together a few pre-fabricated components. To assemble, you only need to match up the numbered parts and install the bolts and screws into the pre-drilled holes. All hardware and a set of assembly instructions is included with each item. For instance, benches are assembled by simply screwing the bench top component to the legs and support braces. Our dining and picnic table tops are assembled as two or three components and only need the supports and the legs installed. If you find that you need help with assembly, please contact Customer Service and we will be happy to assist you.